debbie kay designs: Daily 5 Freebie! 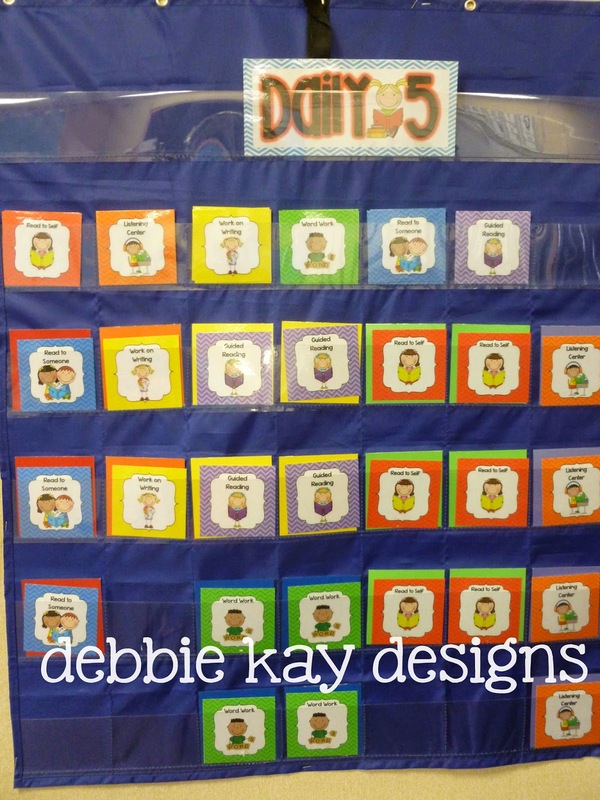 Have you downloaded my Daily 5 Pocket Chart Schedule Cards yet? They are FREE on TPT! I have done Daily 5 by allowing students to choose which of the 5 choices they want to work on, but I have also switched to doing more of a rotation schedule where students do not choose, they are rotated to ensure they are actually doing all the stations. Either way, this is the pocket chart I use and I'll explain how it works. 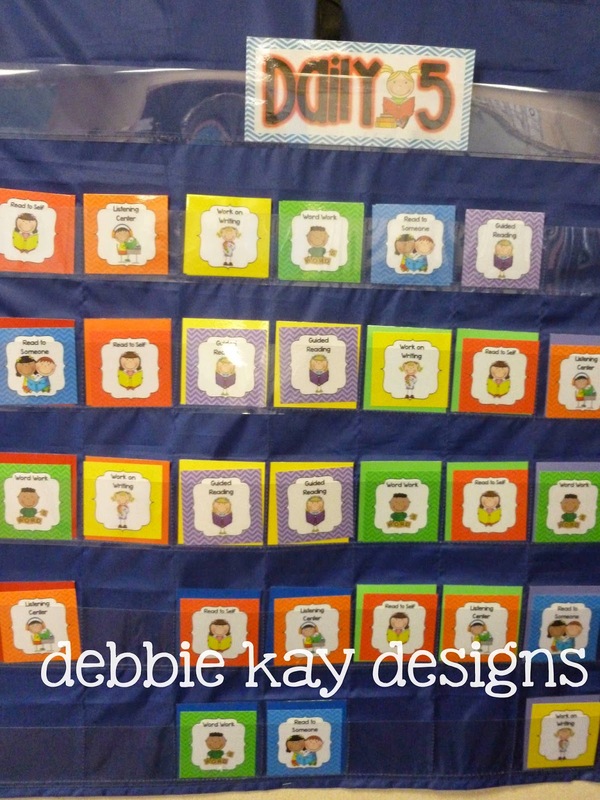 I place the Daily 5 cards at the top for students to choose from. When something runs out (for instance, "Word Work") that means that station is full and students can no longer choose it that round. The colored cards you see throughout the chart represent my guided reading groups. I put removable stickers with the students names on them. For instance, my "red group" has 3 students in it. Unless I am meeting with that group, they will make a Daily 5 choice by selecting a Daily 5 card and placing in their pocket. 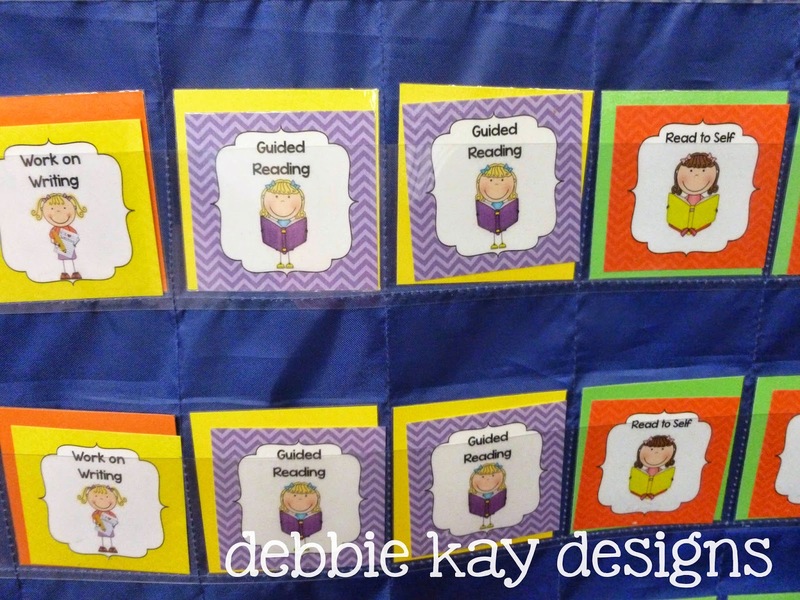 In the photo below you can see that my "yellow group" will be doing guided reading with me this round (all 4 yellow group students have the purple guided reading Daily 5 cards in their pocket). Everyone else has made a choice on their own. Sometimes, it works better for me to put the students on a rotation schedule. It really just depends on how Daily 5 is going in my classroom and what our needs are. The photo below shows how this chart is used when students rotate. I have an entire group rotate to a station. For instance, shown below you can see that yellow group is doing guided reading with me, students in the red group are all doing Read to Someone, while students in the purple group are at Listening Center. To be truthful, I much prefer this method because it eliminates students wasting time deciding what to do, it keeps kids from choosing the same thing over and over, and because the kids in each group are all at the same reading level, they work really well together. But, that's just me and my preference. 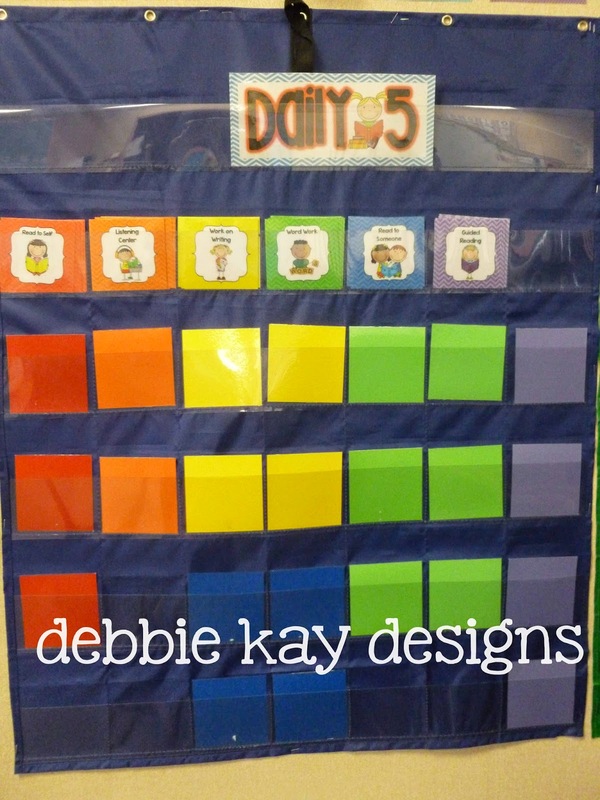 Any way that you implement Daily 5 in your classroom, I hope that my Daily 5 cards will help you and your students stay organized. Download a FREE set of Daily 5 Pocket Cart Schedule Cards here! It's time for... Super Words!!! !